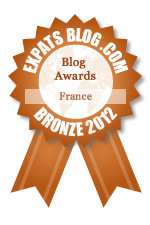 ExpatsBlog.com Expat Blog Awards 2012: France Bronze Award! Only found this blog a few days ago while wandering on Expats Blog. It is very cleverly written and quite funny! I love seeing my home country from the eyes of an other expat. Brilliant! Sara lived in Dublin where I live and now lives in France where I'm from. It's great to read her perspective, I love her blog! I love hearing Sara's story about her family life in France, what adventures she's up to and even celebrating her first Thanksgiving there. A great read! Sara mixes beautiful descriptions of her environment with a distintive creative voice and point of view which always makes for a compelling read! It's truly brilliant stuff. Love this blog! Sara came to France with a great attitude and a sense of humor. As a fellow American living in France, I appreciate and enjoy every post. Thanks Sara! Sara and her French clan make me smile inside out - I love reading about all of them! Have been reading Sara's funny, poignant, and charming blog for a couple of years now. I'm yet another American in France, and I came by way of Ireland, too. But it's not just what's in common....it's just a great blog! This blog has it all! It's funny, insightful, honest and an excellent rendition of life in France from an English speaker's point of view. Did I mention funny? My favorite expat blogger in France! Love this blog! Sara & her adventures in le petit village always brighten my day (as well as often times make me laugh out loud!). As Sara's "godmother", and after having spent two wonderful weeks at her lovely home, meeting "the husband" and Fifty, and visiting some of the places she blogs about, I would have to say that it is always a delight reading about her daily escapades. Her style is so polished and fun to read. Hope everyone has the chance to join in and enjoy! This blog is funny and cute and insightful. I like having a peek into Sara's life and heart. Love this Blog and your wonderful description of village life in France. Everytime I read it I feel I am there with you. Keep up the good work ;-) and can't wait to visit you. The first thing I do every day is read Sara's blog. I have known Sara since she was 12 - and this blog allows me to always know what she is doing. :) I love the humor in Sara's writing. She needs that humor as her French life is considerably different than her Texas life. Great blog and great person!! Sara has a very accesible writing style that is both personal and informative. A pleasure to read. I've had a love affair with this blog for a long time - so witty and insightful and just so much fun to read! I adore Sara Louise, she is a friend but we met through the blog and it's how I keep up with her adventures between visits. Plus she has a dog named Fifty! Tell me that's not a winner right there?! Sara's blog is a joy to read. She captures daily life in small town France perfectly and celebrates all the glorious idiosyncrasies along the way. Utterly divine and as delicious as a frothy cafe au lait! Seeing that Sara has a new post up is like getting a letter from a dear friend. I simply adore her!! I love this blog - Sara's anecdotes and humour get me returning to her blog week after week. A perfect source of vicarious French living! Sara's blog is a vivid, humorous, and delightful find. If you haven't read it, you absolutely should! j'adore Sara :) elle est trÃ¨s aimable! If you've ever wondered what it's really like living in southern France you'll love Sara's blog. It's honest and interesting and really funny - much like the lady herself. There is also a lot of cheese, which is never a bad thing. I always enjoy hearing about her adventures! Sara's blog is the only ex-pat blog I read - it;'s interesting, very funny and Sara is charming and engaging. I have been a faithful reader of her blog for well over two years. She deserves this award! I love, adore Sara's blog! I am a uniblogger, this is the only blog which catched my heart and I follow it religiously! Funny, deliciously witty, surprising, poignant sometimes, Sara makes me smile, laugh, cry. I'm an impat' - I came back home to France after 12 years in the US, and Sara helped me so much to go through this change! Longue vie au Petit Village! Sara is an amazing writer. Her blog brings a little bit of as she calls it, "the LPV" into my home. Sara should definitely win this award! the good morning start entails serving my cuppa without any spills and reading sara's blog. then i can face the world with a big smile. J'adore Sara and her blog! She always has such great stories and is so positive! I always enjoying reading her posts! wonderful, entertaining, funny, moving. I always look forward to reading what's happened next in LPV! Sara's blog is so entertaining and witty - you really feel like you live in Le Petite Village. She can make the smallest instances absolutely hysterical. Sara is one of my faves! She's hilarious and really brings her little village alive in her posts. I always look forward to the next post. Sara has a lovely expat blog. I can't wait to read each new post. And FYI, I don't even read many others, since her blog is so funny and fulfilling! This blog would make a great chick-flick. Sara's blog is awesome! I always look forward to reading what's going on in her corner of Provence, the tales of the LPV villagers, happy moments, funny moments, Fifty's stories, and so much more. In my opinion, she's a very talented blogger and without her stories our days would be a little more blah. Thank you Sara! Great blog. Very funny, and also easy to read even for non-english native like myself. I've been reading Sara's blog for a few years now and it is one if my absolute favourites. Her stories are witty and delightful and she writes beautifully. Thoroughly enjoy Sara's adventures. Keep it up Sara. Sara has my vote....we're both Texans you know! The lovely Sara's blog is my favorite blog. She's got it all, interesting, charming and witty. A great writer and story teller. Oh PLEASE win!!! Funniest ever expat blog on France...keep those blog posts coming!!! Excellent. So nice to catch up on your life and read what adventures you plan next!! Looking forward to more. Great Blog! Love reading it! Sara writes the best ex-pat blog ever! Love reading about her life in France. Very entertaining. It makes me want to visit Le Petit Village! Great blog - love it!! Heartfelt, genuine and very entertaining. Always guaranteed to make me smile. A bloody wonderful blog. Sara's tales about the little village are absolutely great! Her style of writing and perspective crack me up! I love reading about her adventures. She really is a brilliant writer.